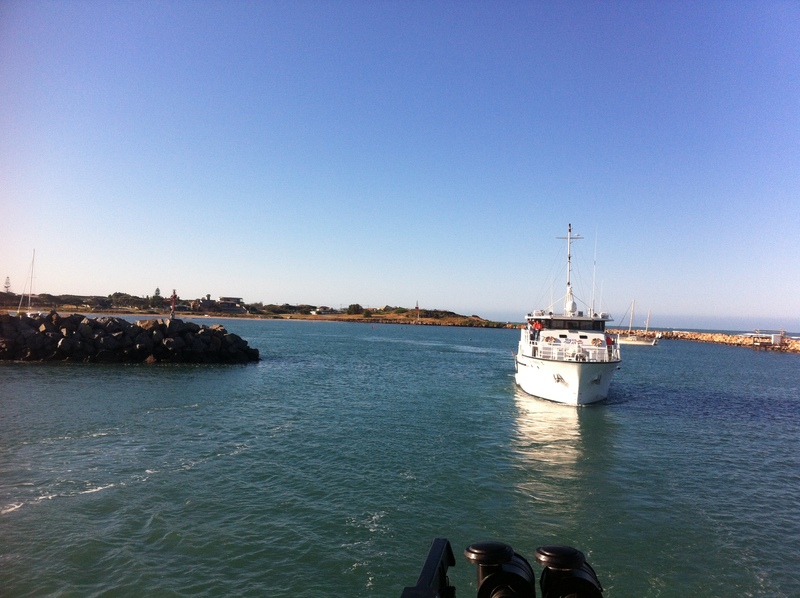 Heading out from Dongara for another day of whale research! Six weeks working as a marine mammal observer on the BRAHSS project, investigating the response of humpback whales to seismic surveys. Although bouncing around in big swells off the coast of Western Australia was quite fun, it was really great to meet so many researchers from around Australia. Since this project involves people from Curtin University, University of Queensland, and the University of Sydney there were plenty of new friends to be made! Prior BRAHSS field seasons were conducted in Peregian Beach on the Sunshine Coast, so 2013 marked the first experimental period for Western Australian. Fine-scale behavioural data were collected during control and active trials, thus detailing the responses of humpback whales to air-gun signals. This work will be compared with data collected on the eastern Australian humpback whales, thus allowing comparison of different populations with different seismic exposure histories. My desk of PhD awesomeness! Nice to be home for a bit! These few weeks gave me time to get-to-grips with my PhD and make progress with my application for candidacy. Within the first six months of the PhD, students are required to submit a 10-page research proposal detailing their intended project. So over these few weeks I did a LOT of reading through the scientific literature and swotting up on acoustics! I was lucky enough to spend some time with the CMST technician Dave who gave me instruction in preparing the noise loggers, programming the recording software, and general electronics! I also got lessons in splicing and mooring design thanks to Miles and Mal, more important skills that I’ll need for deploying my own loggers over the next few years! 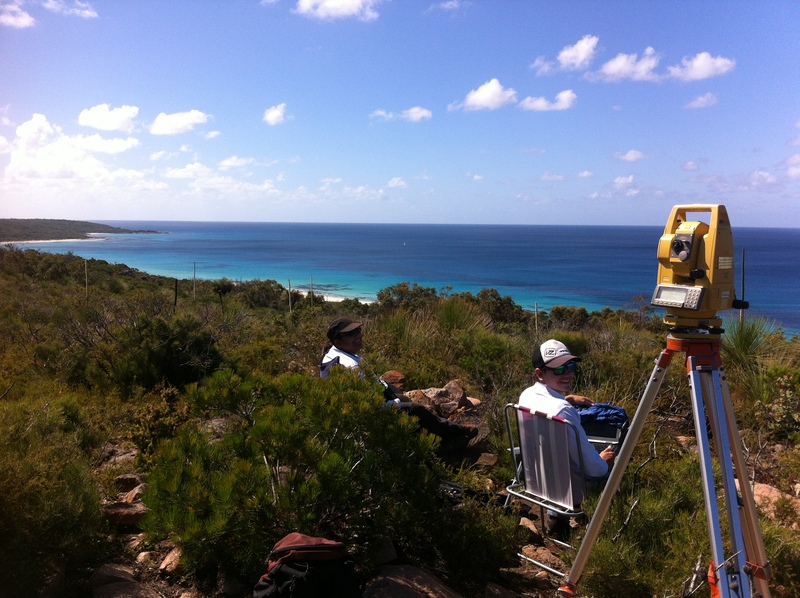 Blue waters and blue whales for the Geographe Bay 2013 theodolite team! A sudden flurry of activity to organise the theodolite and acoustic components of the Southwest Whale Ecology Study (SouWEST) project for the 2013 field season. I headed down to Geographe Bay with Chandra, Angela and Damien to continue our blue and humpback whale monitoring program which has now completed its fourth season! I’m very proud to have been part of this project since 2010 when I helped Chandra with the first theodolite monitoring from our hill-top site near Dunsborough. From here we can track the whales in real-time as they move through the area, and also record their behaviours and pod compositions. Combined with the acoustic monitoring, boat surveys with photo-ID and community-based observations, these data give us a thorough view of how whales are using the Geographe Bay region. This year was particularly exciting, as we deployed an array of four noise loggers – having multiple hydrophones will allow us to triangulate the positions of calling whales, and track them acoustically! It is also our first year with funding from the International Fund for Animal Welfare (IFAW) to support the SouWEST project. Check out my post on the SouWEST blog to read more about our season! I’ve been dying to visit New Zealand for years, so the fact that the Society for Marine Mammalogy (SMM) conference was held in Dunedin this year provided an excellent opportunity / excuse to head over! 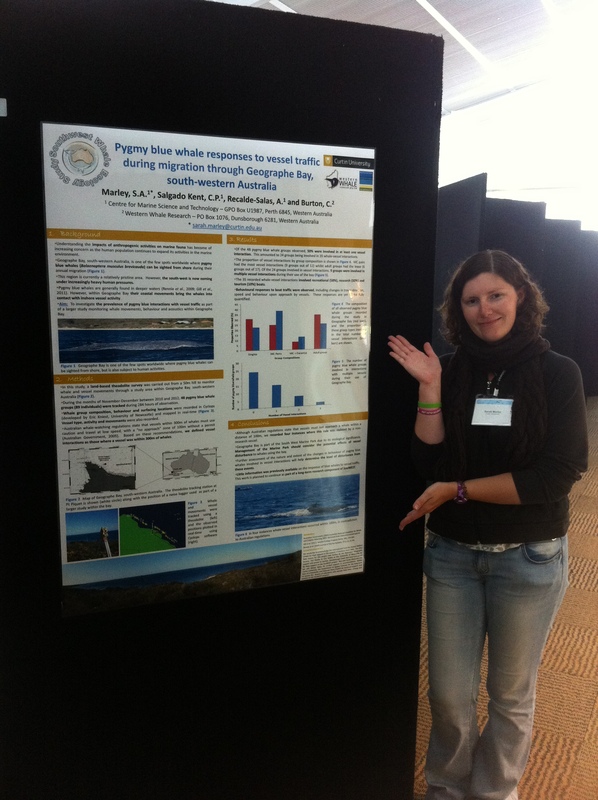 You might remember that I had an abstract accepted back in July, meaning that I was able to present some work on the response of pygmy blue whales to vessels in Geographe Bay. Over 1000 abstracts were accepted for presentation at the conference, and hundreds more people simply attended the proceedings, so this was an excellent chance to not only discuss this research but promote the SouWEST project! Of course, it also gave us the chance to travel! Phil and I flew into Auckland on the 29th November and travelled down to Dunedin for the conference by way of hot water beaches, kayak trips, Hobbiton, glow worm caves, kiwis, thermal spas, sperm whales and Hector’s dolphins! After the conference we headed west to spend a few days exploring the wilderness of Fiordland before heading home, checking out amazing fjords by kayak and boat. Now we’re back in WA and have been immediately thrown into a strange mix of PhD work and Christmas festivities! After taking the time out to travel, there is a lot of work to catch up on… But there are also a lot of people to catch up with! So a 7:30am breakfast meeting the first day home was quickly followed by a CMST Christmas meal with friends (and even a santa!). Writing emails and funding applications is punctuated by present-swapping and Phil’s amazing Christmas cookies. Planning of fieldwork is inter-mixed with planning of Christmas morning beach BBQs and dinner with friends. It’s a strange and busy – but happy – time of the year! So before I nip off for (another) biscuit I’ll wish you all a merry Christmas and all the best for 2014! 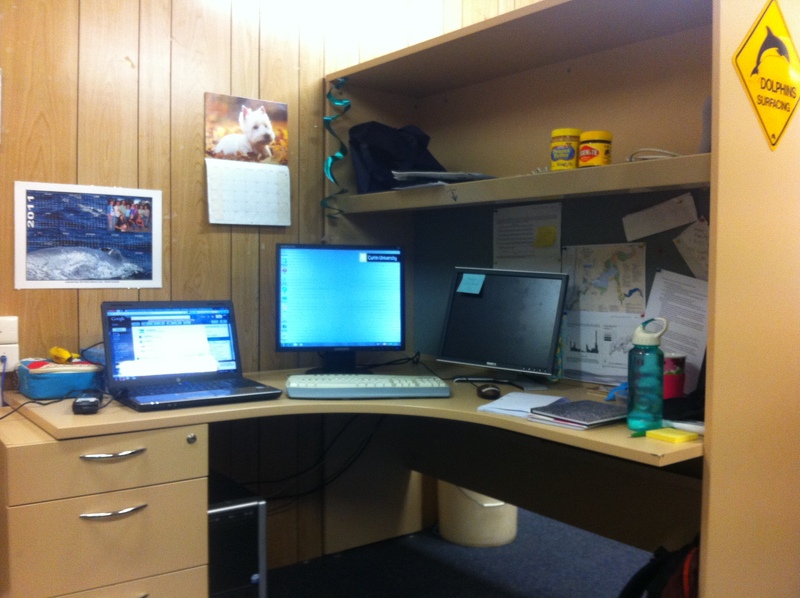 This entry was posted in Personal, PhD Life on December 24, 2013 by Sarah Marley.